The Sun Odyssey 34.2 is fast and well-equipped, given a sleek and balanced hull section as well as strong comfortable deck, it is the first sailboat of its size to offer 3 genuine cabins along with all of the amenities for distance cruising. Its generous cockpit is laid out to organise sail handling around a protected companionway. In the Sun Odyssey 34.2 you have an impression of style and quality. With three genuine double cabins and one single settee berth in the salon. the 34.2 can comfortably sleep 7. With one head with hot and cold shower, we ideally recommend a maximum of 6 for an enjoyable yacht charter with space and privacy. 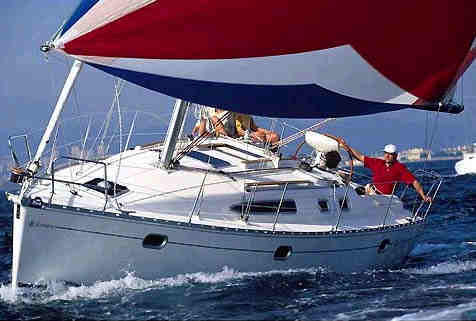 The Sun Odyssey 34.2 has classic slab and roller reefing, wheel steering, GPS and an electric anchor winch. There is a swimming platform and ladder, a bimini and dodger shading the companionway, a dinghy with outboard motor, an ondeck shower and BBQ,AM/FM radio & CD player, fully equipped galley with LPG stove & oven, fridge/freezer, pre-charter cruising guides, full boat and chart briefing. Optionals include a skipper or a provisioning service.